What is an FRFR speaker cabinet? Have you ever seen a speaker advertised as FRFR and wondered what on earth that means? The world of cabinets and modelling amps can be a confusing one but read on and this article will break it right down for you! 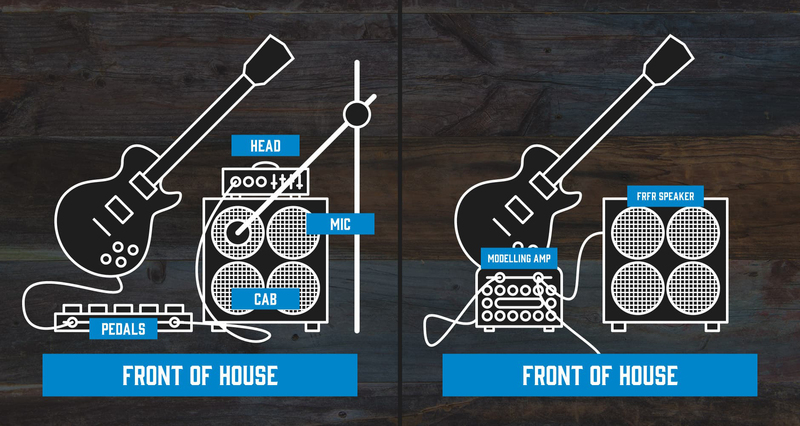 The difference between FRFR speakers and guitar cabinets. How to best use an FRFR speaker. FRFR simply stands for full range, flat response. This means an FRFR speaker can handle any type of tone or frequency fed into it from an amp. The result is a neutral output that emulates the signal as cleanly and accurately as possible. Essentially, it’s a blank canvas. It’s great for modelling amps such as the Line 6 Helix, Kemper profiling amp or the Fractal Axe-FX, that contain every option you could imagine for creating the sound you’re after. On the other side of this is the standard guitar cabinet. The idea behind all the various cabs is that they colour your tone to create a unique sound, like EQing your amp or adding an effects pedal. For example, Celestion Vintage 30 speakers have a tight low-end output compared to Eminence Cannabis Rex’s boomy bass. Even the cab housing can define your tone. In most circumstances, it would defeat the purpose of a modelling amp’s ability to emulate speakers if you were going to hook it up to a non-FRFR cab. There are particular reasons you may want to do this, but we’ll get to that later. As the market for modelling amps has grown, the FRFR speaker’s popularity has too. You may see the term used when you go to buy a new speaker. You might even be tempted to get one. However, there are some points to take into consideration. One consideration to take into account with FRFR is that a speaker can never have a truly flat response. Each model will produce a tiny variation in sound, however minor. That’s not to say an audience could spot the difference but it’s something to keep in mind for real perfectionists. Another bit of food for thought is the ‘live feel’ when compared to a traditional guitar cab. An FRFR sounds like its naked or isolated. As the name suggests, it’s ‘flat’ in resonance and doesn’t do a great job for in-room warmth. A guitar cab provides an air-pushing presence and takes a bit of edge off the high-end because of the housing. That’s why you might want to run a modelling amp into a cab. Or maybe you just love the sound of your Marshall 4×12 so much you couldn’t bring yourself to put it into storage. Furthermore, the option to physically alter microphone placement is a key part of achieving a specific sound. Most modelling amps have a design feature to change the position for the emulated cab, but there’s nothing quite like the real thing, which is an art form in itself. This isn’t to say FRFR speakers aren’t great at what they do. Many gigging guitarists love the ability to rock up at any venue, plug in and reproduce the exact intended sound every time. No faffing around with microphones and all the variables each stage brings. The vast wealth of resources modelling amps offer are also hard to turn down for experimental players, and you need a suitable FRFR speaker to go with it. The likes of Judas Priest, Dweezil Zappa, Trivium, Meshuggah and Periphery use them to create their perfect studio and live setups. Don’t be fooled into thinking there’s just one type of FRFR speaker. They can either come powered or non-powered and you will need one or the other depending on your modelling amp. The standard Kemper profiling amp is non-powered because it doesn’t have a built-in power amp. This means it will need an active speaker to get it to produce any sound. Meanwhile, something like the Positive Grid BIAS comes in a 600W powered version and can be connected to a regular guitar cabinet if you want to reproduce the presence of a guitar cab. You always have the option to turn off the power amp for use with powered speakers. Just make sure you know what you need before diving headfirst into the complex world of amps. FRFR just for modelling amps? Put simply, using an active speaker with a tube head is a recipe for disaster. It’ll sound atrocious at best and it’ll probably result in a fire under any other circumstance. Please don’t do that. But a non-powered FRFR, on the other hand, could yield some interesting results. For one, you have infinite headroom, so if you’re after that high gain metal distortion without becoming slushy, it could prove to be an option. The overall sound would be cleaner and less coloured than with a cab. But apart from that, it comes down to preference. An Orange 2×12 will always sound like an Orange. An FRFR speaker can provide the extended versatility you’re looking for. At the end of the day, it comes down to the individual needs of the player, such as touring or studio use, or simply if you’re a sucker for a good old set of Celestions. There isn’t a competition between FRFR and traditional cabs, it’s more a choice between utility and feel. Both have their merits. Want to know more? Check out FRFR guitar cabinet range here. If you’ve enjoyed reading, why not check out the rest of our learn content while you’re here? Cian is a copywriter for the Andertons web team. He shares his birthday with Muse frontman Matt Bellamy and believes he will one day reach the same level of stardom. Cian is a big prog/modern metal fan so naturally loves Bare Knuckle pickups and headless or pointy guitars.